Time for shameless promotion! 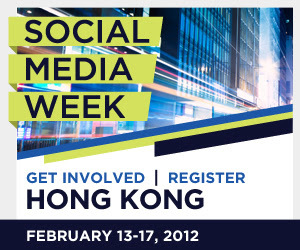 For all social media enthusiasts out there I am sure you are aware of the Social Media Week happening around the world during Feb 13-17, 2012. Hong Kong is hosting a series of talks and events throughout the week and Hong Kong is the only city in the Greater China Area having the luxury of hosting. One of the events is Getting Social with Smartphone Photography of which a panel of smartphone photographers will be sharing some of their works and how they share (or over share in come cases) their images online using various social media applications. What so special about the event? Well, I am one of the panels and will be sharing my experiences on stage. Wish me luck!! Aside from the shameless promotion bit, I do find mobile technology has changed the social norm quite a bit over the recent years. The same applies to blogging as well. Blogging used to be expressing your views in writing by posting online via certain blogging platforms. Gradually images became an important part blogging / writing just like the saying goes, "a picture is worth a thousand words." The introduction of twitter or micro blogging has somewhat taken over the role of tradition blogging in my opinion. I have a feeling that readers prefer to read less and less nowadays because there are an overload of information out there and only limited time. The popularity and economical use of smartphones help the rise of tumblr and instagr.am is a good example of how visual medium or images in general have taken over the traditional role of words in many cases. Is that a good thing? Is that the revolution of media in the next few years? Should the market prepare for a more visual approach rather than traditional written approach for various brands? Perhaps but the issues and concerns are more than just how brands and companies should adapt to this new trend, it is a matter of social development in my opinion. What happened to the skills of writing and can a simple image express the same thing in words? It is an issue worth discussing and the topic itself is worth a dedicated post which I will work on soon. First of all - I hope the event tomorrow goes really well. I would have liked to be there to cheer you on! As far as blogging goes - there is no one trend in my view. Micro-blogging and visuals with few words are coming to the fore. But, on my blog, I've been having the best numbers in a long time over the last six months, despite serving up a regular diet of 500-800 word posts. @Fernando, hope you can join in before the session as well! It is good to hear that readership is going strong on your end, I do hope readers get back into reading more often as well as writing, be it creative writing or simply writing down whatever comes to mind. I do want to to write more often and write on topics that are relevant to me as well as the things I like. It is part of my wish of 2012 to do so ... wish me luck! Smartphone Photography and be Creative!